Hepatocellular carcinoma (HCC) is the most common primary malignant tumor of liver that has a very high incidence in Asia especially Japan. Other places like Taiwan Penghu, Shanghai (china) have high incidence of liver cancer. There are generally 2 pathological types of hepatocellular carcinoma. The 2 pathological types are fiberlamellar vs non-fibrolamellar (most common type). Fibrolamellar: This is not associated with Hepatitis B, C or Cirrhosis. Nonfibrolamellar (most common) and associated with cirrhosis from alcoholics, hepatitis B and C.
Cirrhosis causing risk factors that eventually lead to hepatocellular carcinoma. Coinfection with HCV and HBV has also been associated with an increased risk of HCC than individual infection alone. Aflatoxin B1 (carcinogen found in fungus) called aspergillus that induce p53 mutation which is a guardian tumor suppressor gene. Schistosomiasis parasite infection can also cause liver cancer. Protectibbe factors: consumption of white meat and statin use has been associated with decreased risk of hepatocellular carcinoma. The pathogenesis is believed to be from hepatocyte damage and rapid cellular turnover from healing in a cronic inflammatory setting caused by chronic hepatitis B or C infection. 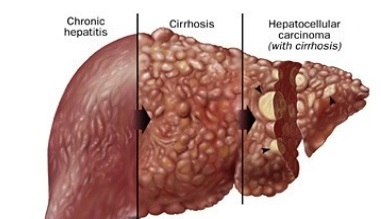 The imbalance in microenvironment of liver and cytokines of livers infected with the hepatitis C virus, and ultimately causing cirrhosis. Paraneoplastic syndrome : Increased RBC, Platelets, Calcium, Carcinoid syndrome, hypoglycemia, increased cholesterol, hypertrophic pulmonary osteodystrophy. Alpha fetoprotein (AFP) elevation – useful screening tool and monitor response to treatment. Cirrhosis patient need screening for hepatocellular cercinoma via ultrasound (US) and AFP levels every 6 months. Hepatocellular cercinoma have the tendency for hematogenous spread to other areas. May lead to Budd Chiari Syndrome that occlude/thrombosis in the IVC, hepatic vein. The mainstay of treatment is surgical resection but most of the patients are not eligible due to metastasis or underlying liver dysfunction. Other treatment modalities include: Liver transplantation (if diagnosed early and able to get on the list). Others include: radiofrequency ablation (RFA) and microwave ablation, percutaneous ethanol or acetic acid ablation, Radioembolization, transarterial chemoembolization, Cryoablation, radiation therapy and stereotactic radiotherapy. Systemic chemotherapy and targeted therapies with molecular agents are currently being studied. The specific treatment option depend on both the disease extend and the severity of underlying liver disease, which limits the tolerance to any therapy. For patients with cirrhosis, the Child-Pugh classification is used to stratify patients according to their underlying liver disease. Sometimes other measures are increasingly used.